No matter where you are in New York City, you're destined to encounter the street vendors selling fresh roasted nuts. Now enjoy these addictive snacks no matter where you live and recreate your New York City memories. One of our fondest memories about New York City is the plethora of fabulous food options available at any given moment. The first time we visited NYC as a couple, we discovered restaurants like Eli Zabar’s E.A.T. on Madison Avenue with its overstuffed sandwiches and fresh salads, Pizza Italia in the financial district with their enormous thin-crust pies that we had to fold in half to eat, and the Oxford Café in midtown on Lexington Avenue with its cheerful staff, fresh-squeezed orange juice and melt-in-your-mouth breakfast sandwiches. As you can imagine, for the foodies that we are, New York is heaven on earth. But no matter where we were in my favorite metropolis, it was the street vendors with their huge pretzels, juicy hot dogs and fresh roasted nuts that beckoned to us most. Whether we were standing in line at the TKTS booth in Duffy Square waiting to buy discounted Broadway tickets for shows like Thoroughly Modern Millie and Cabaret, surfacing outside Grand Central Station, walking through Central Park, or exiting the Met, the scent of street food wafting up to us drew us like bears to honey. 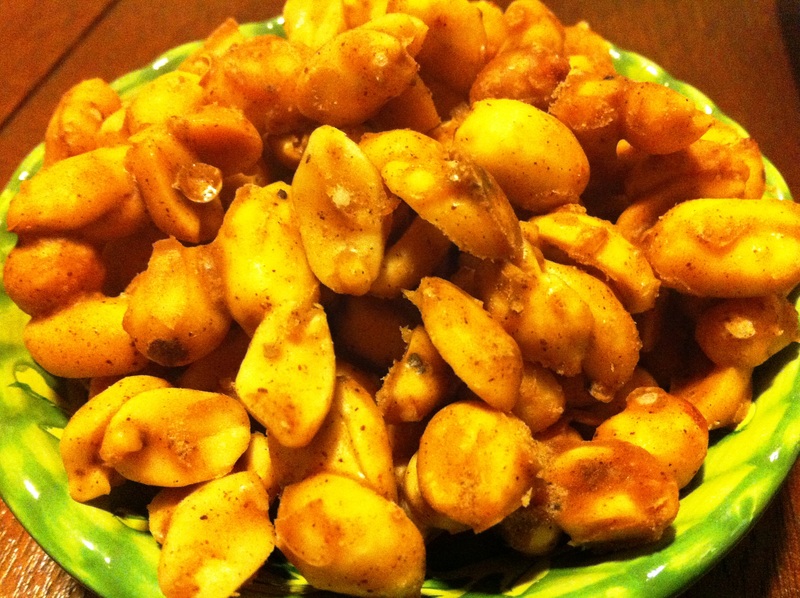 No matter how much we ate, we could never get enough of those amazing nuts. Now we recreate the experience at home with this quick and amazing recipe that lends a sweet heat to our favorite nuts. In a large stainless-steel skillet, combine nuts, sugar, and 1/4 cup water. Bring water to a boil over high heat. Lower heat and simmer, stirring frequently, until water evaporates and sugar crystallizes around nuts, about 5 minutes. In a small bowl, combine coriander, cinnamon, allspice, cayenne, and salt. Stir into nuts and continue cooking, stirring occasionally, until sugar begins to melt and caramelize, 1-2 minutes. Remove to a parchment-lined baking sheet and pour remaining caramel over nuts. Cool to room temperature before serving, about 5 minutes. TIPS: The caramel coating will congeal on the parchment and may resemble peanut brittle. Simply lift cooled nuts off paper and crumble apart. Store remaining nuts in a resealable plastic bag for up to a week.